A new report by EFAD member Amnesty International details how US airstrikes, carried out with both drones and manned aircraft, have killed more civilians than the Pentagon admits. Under Trump, Somalia was declared an active area of hostilities in 2017. Since then, the frequency of airstrikes has increased rapidly. The US military has maintained the position that there were zero civilian casualties during the more than 100 strikes carried out since early 2017. But research conducted by Amnesty found at least 14 civilian casualties as a result of only 5 of those airstrikes. 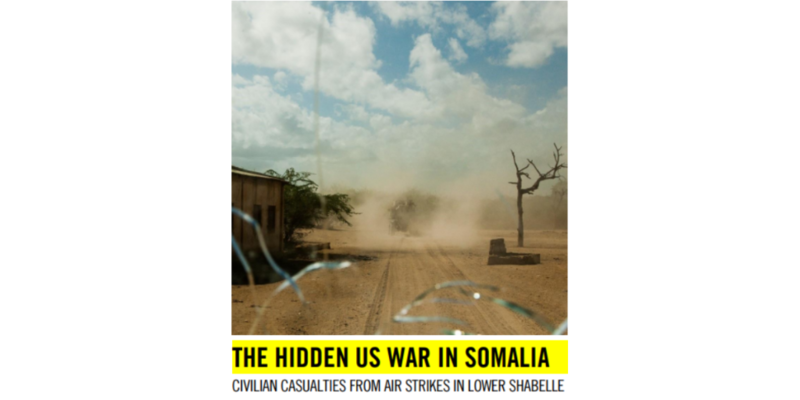 The report, ‘The Hidden US War in Somalia’, is based on more than 150 interviews combined with satellite imagery, identification of fragments of munitions, and pictures taken after the airstrikes took place. The attacks covered in the report may have “violated international humanitarian law (IHL) and could, in some cases, constitute war crimes”, according to Amnesty. Claims that US strikes have caused civilian casualties in Somalia have also previously been put forward by the Bureau of Investigative Journalism as well as the Centre for New American Security. The involvement of EU countries in facilitating the US drone program, particularly in Somalia, has also been scrutinized by human rights organizations. In the Netherlands, the Nuhanovic Foundation has represented a Somali drone victim who was targeted possibly with the help of data shared by Dutch intelligence agencies. In German courts, ECCHRhas argued that the US’ use of Ramstein air base for a drone strike that killed a Somali herdsman violated German and international law. Only yesterday, in a ruling on a similar case concerning Germany’s involvement in US drone strikes in Yemen, the Higher Administrative Court in Münster found there were doubts on whether US operational practices were in line with international humanitarian law. The Court also ordered Germany to take concrete steps to bring the US’ use of German facilities for the drone program in compliance with international law. The report comes at a turbulent time. The findings of Amnesty, together with the findings of other organizations and the judgement given by the court, all underscore the need for the US to conduct transparent investigations into the ways in which it carries out drone strikes and tracks civilian casualties. Last month, the Pentagon reported on the development and implementation of a new, comprehensive policy on civilian casualties, after organizations such as Airwars identified a higher number of civilian casualties in US airstrikes for over several years. But only two weeks ago, Trump rolled back transparency measures on the reporting of civilian casualties of drone strikes outside of warzones. As a result, the secret unending war taking place in countries such as Somalia and Yemen will become even more obscure to the public. The European Forum on Armed Drones calls for States that use armed drones to publish their rules and procedures to show full compliance with international law, including preventing, mitigating and investigating all unlawful deaths, and more broadly all civilian harm. For more information on EFAD’s position, see our Call to Action.